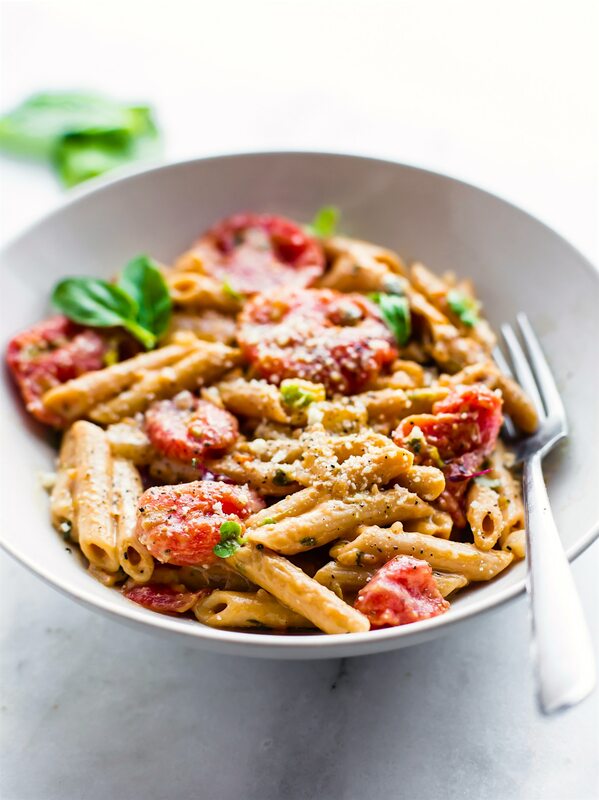 Gluten free pasta with creamy tomato sauce, ready to eat in 25 minutes! It’s delicious and dairy free. This gluten free pasta recipe is perfect for those who are new to gluten free eating or are looking for a lighter pasta alternative. 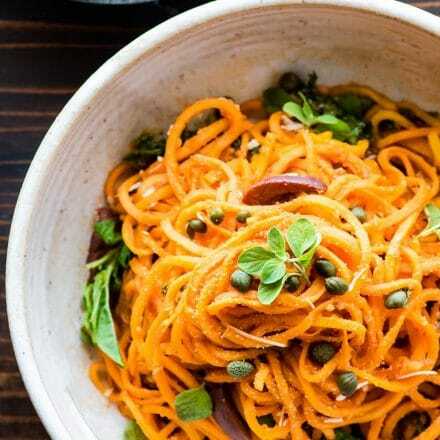 It’s protein packed vegetarian pasta with a healthy amount of plant based iron. **NOTE: This post was originally published in Winter 2014. I updated the photos and the refined the recipe. Now I’m republishing the updated recipe because it’s WAY better! We interrupt the Holiday food extravaganza posts to bring you a quick and healthy gluten free pasta recipe. Because let’s face it, you’re gonna need some carbs for fuel this week! Haha. Now keep reading. Why is My Pasta Mushy? Mushy pasta got you down? Want a gluten free substitute for your regular pasta that doesn’t turn to mush? For those who have been eating gluten free for quite some time, you understand. Remember the days when every gluten free pasta was made from corn and it melted in the pan? Haha. Yep! 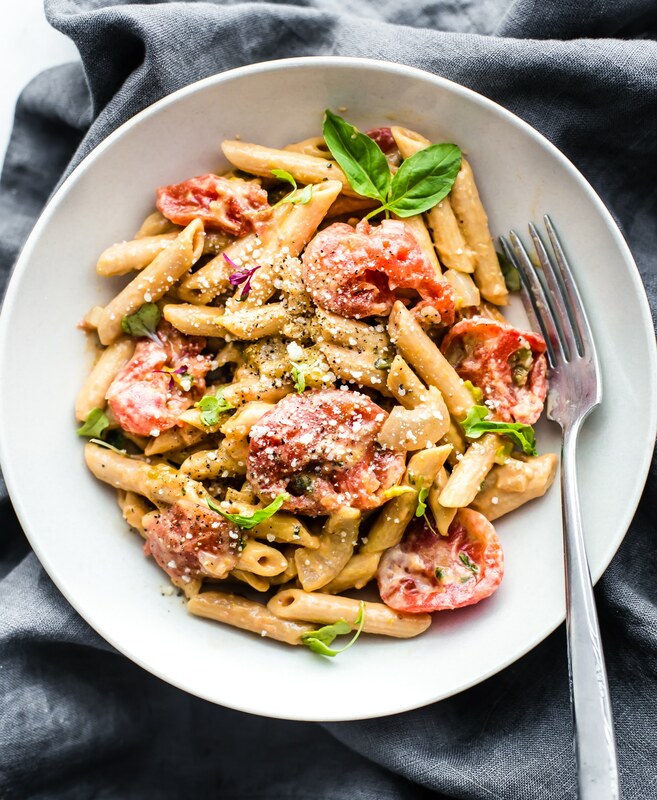 And for those who are new to eating gluten free, I’ve got a creamy tomato gluten free pasta dish that’s gonna rock your socks off. It’s also dairy free, easy to make, super duper yummy. Just sayin…. I’ll explain more below. But first, the answer to why is my pasta mushy? Because it’s over cooked! Cooking pasta to al dente is the key to preventing mushy pasta! Plus, gluten free pasta that is cooked al dente will digest and absorb more slowly than mushy pasta. So, it’s healthier for you to eat it that way! I don’t believe in a one size fits all meal plan. Instead, I (we) try to focus on what the body is currently needing. For instance, if my husband is training for an event, or if we are having a stressful month (yea, that happens), then taking care of adrenal health is important. 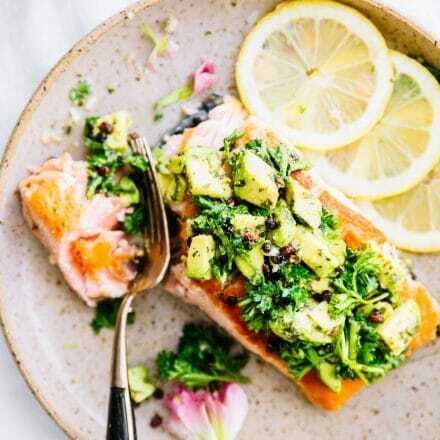 We have found that adding in a bit of healthy gluten free carbs at dinner can help with sleep and cortisol regulation. I should note, this is what has worked for us. Plus, it’s a nice switch from low carb or paleo from time to time. Just my two cents. Okay, so here we are in the holiday hustle and bustle. Needing to nourish the body and adrenals. Adding a bit more healthy carbs now is a good thing. Hence the dairy free, gluten free pasta recipe. The gluten free penne pasta I found is the best kind, in my opinion. I’ve found two types of gluten free pasta that I adore. One is a buckwheat pasta and the other is a lentil pasta. Buckwheat gluten free pasta is made from buckwheat flour. Buckwheat is pseudo-grain, which is not really a grain, but a seed, from the rhubarb plant. For those with healthy hormones and healthy guts, buckwheat is well tolerated, especially if it’s soaked or fermented. Remember the crunch bars I made? Yea, those are made from buckwheat! The other gluten free pasta I found (and love) is lentil pasta. I love using lentil pasta because it adds in more plant based protein without adding meat. Oh, and fiber to boot! 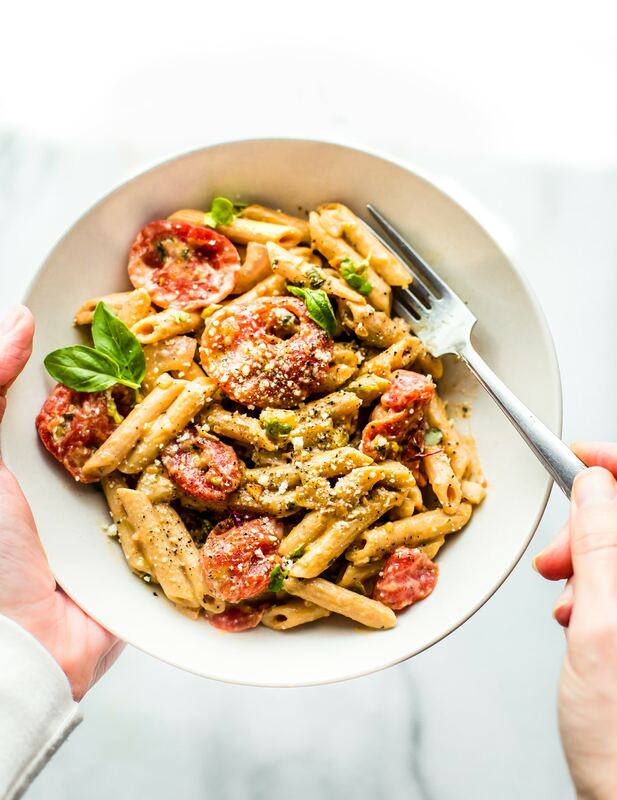 Actually, both types of gluten free pasta contain significant amounts of protein and significant levels of other nutrients, especially B vitamins and iron. One last tip and trick for making this super easy and healthy gluten free penne pasta recipe —> USE an EGG YOLK combined with paleo mayo to get it extra creamy! Yes, it’s almost like a carbonara style pasta, minus the cheese. And that’s how we add in more good fats and Choline without the dairy. Just mix a tiny bit of mayo and egg yolk together, then stir it right into the gluten free pasta. 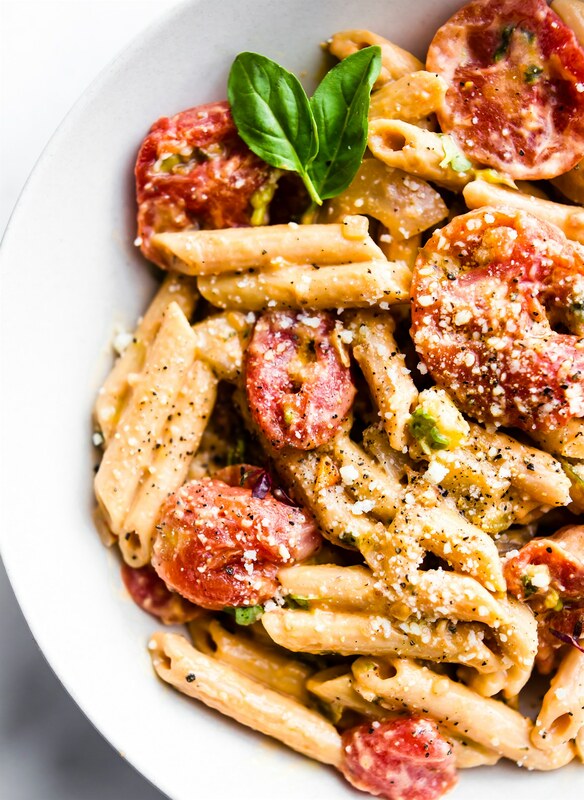 It melts together with the tomato and onion, which makes the penne pasta extra creamy. You can also use nutritional yeast or even a cashew cream sauce! Shhh… don’t tell the cheese lovers my trick. Let’s see if they notice the pasta is even dairy free. GASP! I’m sneaky! Ingredient Notes -> I found the the lentil and buckwheat gluten free penne pasta at our local grocery store, but you can also buy spirals here. diced chicken or chicken sausage. Sauté onions and peppers in 1 tbsp olive oil with garlic. Once they are almost cooked, set aside. Then cook your gluten free pasta according to directions. Drain, and add pasta back into pot. Keep on low heat. Add the rest of the olive oil and mix well. Crack an egg into the pasta and mix gently. Add in tomatoes, seasonings, and the rest of your onion/pepper/garlic mix. In another small bowl, combine paleo mayo and egg yolk. Add egg yolk/mayo mixture to the pasta. Stir gently over low to medium low heat until creamy. Just enough for the egg yolk to cook but not all the way through. If using a cooked protein, add it in here. Serve pasta and add fresh basil to each bowl. Or feel free to mix a little in with the big pot. If you are looking to make this vegan, just replace 1/4 cup mayo with my vegan cashew cream sauce and add 1 tbsp nutritional yeast. YUM! 9 grams of protein ain’t to shabby, eh? Add some extra protein with chicken, beef, or even shrimp if you’d like! Alright, bottom line, gluten free carbs are great to experiment with for active kids, athletes, healthy adrenals, etc. Oh for the love of carbs! Did you miss any older Cotter Crunch gluten free recipes? I’ve got ya covered! Check out my Cotter Crunch Blog Pinterest board. Shameless plug. 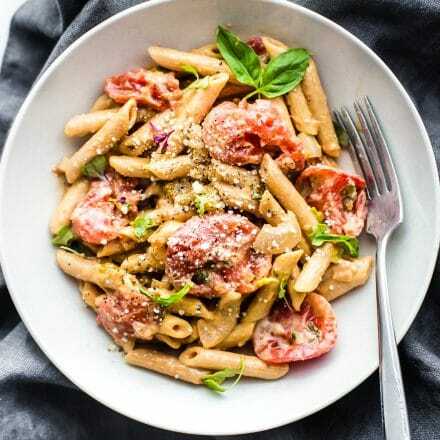 Now, go make this creamy tomato gluten free pasta recipe for your friends and family. Or maybe this spaghetti squash pasta recipe. But maybe don’t tell them it’s actually super healthy, gluten free, and dairy free. Let’s see if they even notice. Mwahahahaha….. trickster! What’s your favorite gluten free pasta recipe? this is why i love the buckwheat pasta! tastes amazing! Ya, i know that pasta mush.haha. This one is 100% buckwheat. WHich is awesome! I found it at our local grocer Randalls/Safeway. there is another brand KING soba pasta/noodles that is delicious and doesn’t mush! So good. Let me know if you want the links. Please. 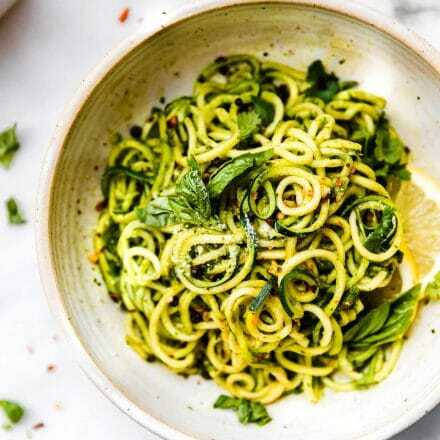 I also found some spiral noodles on Vitacost. The brown rice noodles work for me sometimes, but I don’t always do well with grain in general. So I like to rotate them. I follow you on IG and have never visited your website. Excited to see all the yummy recipes you have. Awesome recipe. Can’t wait to try it. Our Chickapea Pasta would be awesome with this recipe! It’s gluten free and only made with 2 ingredients…chickpeas and lentils. High protein and high fibre AND it tastes like pasta. It’s available on amazon.com. I for one, am trying this recipe tonight! Thank you. for sure! i gotta try it! Yum!!! I haven’t found a gluten free pasta I really like yet, but this sounds great! you will like this one! doesn’t melt! Adding an egg to anything makes it so so much better! I am not much of a pasta person, but maybe I should give buckwheat a go just for fun, I am sure it has a lovely flavour. Love carbs. hello #carbloading for life. And I adore buckwheat pasta–soba noodles are just about one of the only types of noodle that I really like! I can’t find a pasta that is rice and corn free! Looks amazing though… I’m dying! we are ALL about the carbs here…ESPECIALLY on lifting days! I love me some buckwheat too, so I am swooning over this….AND WITH AN EGG. you win. Pinning! Egg yolk crumbles on top, wow you are on to something! I love that egg yolk trick- I’ve never mixed it into pasta before but I’ve seen it called for in recipes and it sounds really good. You’re such an awesome sherpa! ahh well thanks friend. I’ve got the sherpa fro and all. right? LOL! We are always on the hunt for GF pasta that the entire family will eat. Right now, we love TJ’s Brown Rice– none of my kids can tell the difference between this and regular. I will have to try Buckwheat pasta for sure. My mom used to make us BW Pancakes when I was little, so I have fond memories of the flavor. oh i need Tj’s! i forgot about their pasta! Have never seen buckwheat pasta at Whole Foods or any of the numerous health food stores I shop at weekly and I live in NYC. What’s the brand you buy? Love your blog! do you live by a randalls or safeway? I actually found it in their GF sections and it’s their Eating right brand. SO good! Ahh I don’t know if I’ve ever had buckwheat penne…. Clearly I need to try it! For the love of carbs — you know the way to my heart 😉 I’ve never tried buckwheat pasta, but I LOVE buckwheat… especially the toasted kind (kasha) that I grew up with. Is it lunch time yet?!?! Lindsay I always learn something new from your recipe posts – I had no clue prior to just now that buckwheat and rhubarb were related! I have yet to try buckwheat pasta – but this looks and sounds good enough for me to hit Whole Foods on the way home! Thanks lady – and hope you and the kiwi have a wonderful weekend! heck ya add cheese! and yay pinterest! 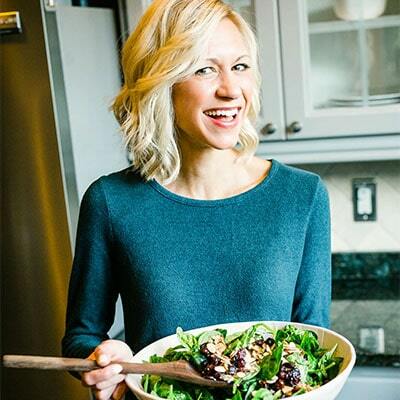 you need to follow amanda’s clean eating board too. we all pin there! I love pasta, but you really had be at egg! Happy VD, Bro! I’m not a big pasta fan, but I do love buckwheat. I need to give this a whirl! I really just don’t like pasta anymore (gluten-free or not! )…but buckwheat is one of the greatest seeds(grains)! Let me know if you try it! it’s also good with squash spaghetti! eggs for YOU! This sounds so yummy! We are egg-crazy in this house, so I’m sure this would be a hit. And thanks for the info about buckwheat. Learn something new everyday! Ps. I love your gut health board! I have never tried this pasta but I trust you if you say it’s good! I will look for it in the stores…I use nutritional yeast for Italian dishes in place of cheese. So good! What do you think of the quinoa pastas? I never tried those either but always see it. i like the quinoa pasta too but it sometimes melts for me. the buckwheat is more al dente, ya know? Great tip about the egg yolk!! Love me some carbs!!! Favorite gluten free pasta would have to be Garofalo (Corn, Quinoa, Rice, and Fiber) Gluten Free Pasta. then you’d love this! it’s the best GF pasta i’ve found yet! YES this sounds great, I love eggs and tomato! And gluten free seals the deal for me. you got that right! WOOHOO! Wow I love buckwheat pasta! This looks great! My kids would probably love this too! oh totally jess! kid friendly! he actually got this before he left, phew! but i have made it 2x after he left. hehe. People are so confused about carbs! 🙂 It is not the carbs but the type people eat… 🙂 Yes, we have to manage how many but carbs are not the enemy. Pasta isn’t something my husband and I would eat much of, but especially now since we’ve gone to a more low-carb lifestyle. But this seems like a great, healthy alternative! Is buckwheat pasta something I can find in most grocery stores, or mainly health food stores? hehe yes, that is my logo there. And we like buckwheat because it’s not really a grain. It’s great for post workout, ya know?But Whatever works best for you, ya know? i know me too! just buckwheat soba noodles. so when i found these, i fell in love!! thanks so much for your encouragement Ellie! You are amazing! 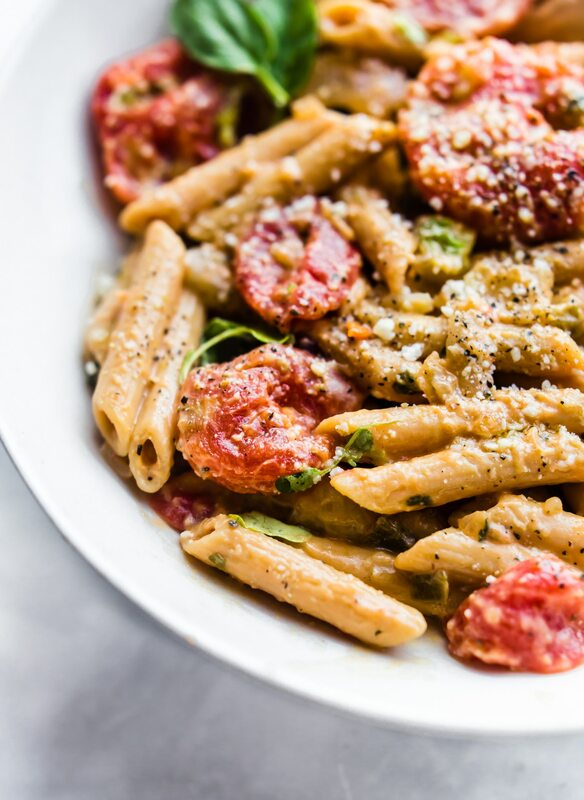 Need to get my hands on some buckwheat penne – this pasta dish looks so incredibly comforting and delicious! I am not a big pasta fan. Just not exciting to me however I love gnocchi… I know it has gluten but I suppose you could use some gluten free flour to make it too! Carbs are so bad. Kidding. I love it when you write about the various types in these kind of posts! I LOVE adding eggs to pasta too! death by carbs!!!! just kidding. Hope you get to try this soon. Post paleo? YUM! I’ve never seen buckwheat pasta around here before, I’ll have to keep an eye out though because the BF Is a big pasta fan and corn pasta just isn’t the same. of course! come on over!! My Valentine is gone again so maybe I’ll just double the onions. I love the addition of the egg. Genius move. I love a good pasta 🙂 This looks SO good! let me know if you give it a whirl! Could you please point us to where we can find the buckwheat penne pasta? I have some quinoa pasta in my pantry that I’ve been meaning to make. So good! I’ll have to give your sauce a try with it. Love that egg yolk tip! which quinoa one do you have? I got mine from NOW foods when I was there last summer on the tour. This is seriously gorgeous! It looks like a farm to table restaurant dish! Brava! thank you friend! I adore you and your encouragement. Wish we could dine together! This sounds so delish! I’ve yet to try paleo mayo..and I never would have though to use it in a pasta sauce! girl, you gotta try the primal kitchen one. SOOO GOOD! 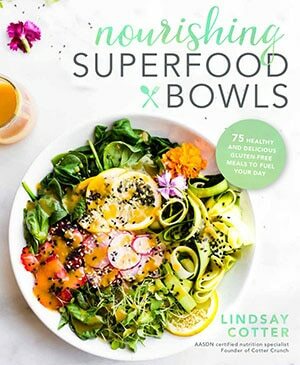 Another mouth watering recipe Lindsay! I have become a fan of your blog. 🙂 Initially I tried Cauliflower soup and now this my weekend ‘s dish for sure. Thanks for sharing my favorite pasta recipe. Your recipes are always attractive. I love many dishes, in there, pasta. It looks delicious and colorful. I like this recipe. I would never have thought to use it in a pasta sauce! I am wondering– if I am not a huge fan of mayo, will I not like this? Is the mayo super strong in terms of flavor? I didn’t taste it much, but you could try adding a creamy non dairy dressing or yogurt. If you can have dairy. Does that help? 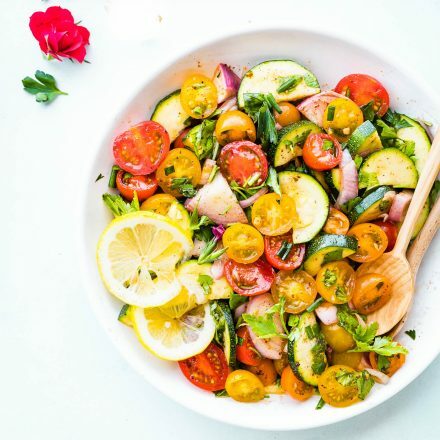 I love this recipe, I recently had to remove wheat and dairy from my diet..this has been my go to dinner. I play with different sausages, some sweet and then a spicey. I have added broccoli and or mushrooms..it’s alwaya so good!! Wonderful! So glad it’s helping you transition Jaime! So good my husband had seconds. Added mushroom and spicy GF chicken sausage.